The MSLHST is a clinical method used to examine the balance capabilities of an athlete, one leg at a time. What changed from the BASS to the MSLHST? The Multiple Single-Leg Hop-Stabilization Test (MSLHST) is a dynamic and static balance assessment tool designed for the sporting population and based on the original BASS Test  and its modified version  for assessing balance. The MSLHST is a clinical method used to examine the balance capabilities of an athlete, one leg at a time. The subject performs dynamic forward and diagonal one-legged jumps while statically maintaining landing positions . The original BASS Balance Test was first introduced over 80 years ago , and later modified for improved application (read about the “Modified BASS Balance Test” HERE) . Traditionally, a balance test was performed in neurological patients with the task to maintain a certain position as long as possible . The BASS Balance Test laid the groundwork by implementing a more challenging task into balance testing. Since then, it has been adapted throughout the years, and recently optimised by Riemann et al. in 1999 who renamed the test “The Multiple Single-Leg Hop-Stabilization Test (MSLHST)” . Healthy balance is maintained by the interactions of multisensory body systems that are orchestrated by the brain and spinal cord [4, 9]. Proprioceptive, as well as visual and vestibular information is processed and results in actions of the musculoskeletal system . Testing balance in a standardised way, while offering enough challenge to prevent ‘ceiling effects’, is a common struggle in fitness testing and has resulted in no available gold standard to date . Having said that, this modernised version is a more reliable clinical tool used to assess balance in an active sporting population [6, 8]. What changed from the BASS test to the MSLHST? The “Multiple Single-Leg Hop-Stabilization Test (MSLHST)” [4, 8, 9] was adapted from the BASS test to ensure an equal challenge for all participants. Improving on the Modified BASS Balance Test, the MSLHST controls for upper-body and arm sway, whilst also normalising the error scoring to achieve more reliable and valuable clinical test results. One of the major problems with the design of the Modified BASS Balance Test is the inconsistencies regarding the error scoring and irregular challenging of the test subject. Since the marker distances remain the same for all participants, a taller person may have little trouble performing the jump, while a shorter athlete may struggle considerably . The introduction of the Balance Error Scoring System (BESS) into the test, makes it more reliable and comparable to adjacent scientific work. BESS values show great correlation with the sway of the centre of gravity, as recorded by a more expensive force plate in a laboratory setting . Always perform fitness testing on a dependable surface that is not affected by wet or slippery conditions and protected from varying weather types. Changing the testing environment will weaken the reliability of repeated tests and could potentially result in worthless data. The test is performed with the subject standing on one foot on the start marker looking straight ahead. Both hands are to be rested on the ipsilateral iliac crests for the entire duration of the test. A metronome gives an audio cue every second to ease time orientation for the subject. When instructed to jump to the following marker (marker #1), the subject may take a brief look at the goal marker, jump, and land covering the marker with the foot entirely. Eyes should be looking straight ahead while maintaining the position for 5 seconds before advancing. The 5-second stance is counted aloud by the tester to further facilitate the time orientation of the subject. 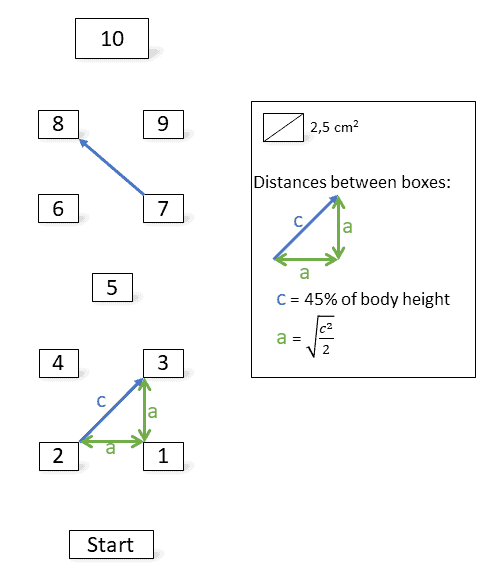 All markers are to be jumped to in the numbered order as depicted in Figure 1. 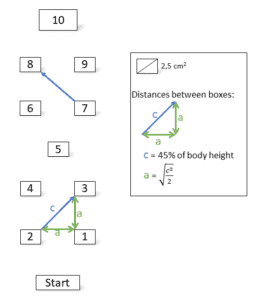 Figure 1: Representation of the boxes marked on the ground with sports tape (Adapted from ). Foot dominance (i.e. preferred foot to kick a ball) is to be determined before conducting the test and to be noted. However, the order of foot testing would ideally be randomised. Any observed errors during any of the jumps to a marker are not to interrupt the test, or to be commented on in any way. They are simply noted in real-time on the performance sheet in a point fashion as shown in Table 1. For the 10 marker jumps, a maximum of 130 error points can be observed. Lower error scores are defined as a better performance and ultimately a higher balance ability. To determine if a test is valid, inter-tester, as well as intra-tester reliability, must be determined. Inter-tester reliability is being calculated by comparing test-values of the same subject by at least two different testers. Thus, intra-class correlation coefficients (ICCs) of how “equal” the test results are can be shown. Riemann et al. examined inter-tester validity using repeated-measures analyses of variance (ANOVAs) with three testers who were each blinded against the results of the other testers and performed each test twice. Test repetitions were 48 hours apart . They were able to show very good inter-tester reliability with ICCs ranging from 0.70-0.92. While the landing error scores showed no significant difference between the testers (ICC 0.92 and 0.92), the balance error scores differed significantly between two of the three testers resulting in slightly lower ICCs of 0.70 and 0.74. Still, even the lowest value (0.70) is still in the “strong” correlation category. Until 2017, the intra-tester reliability of the MSLHST had not been investigated. Sawle et al. conducted their intra-rater reliability study with one investigator in a single session. Their findings show an ICC-range between 0.72-0.88 that point towards good to excellent reliability of repeated tests. Other than for Riemann et al. , this study found better reliability scores for balance (ICC 0.88 and 0.87) instead of landing scores (ICC: 0.72 and 0.78) . Both studies reflect differences in score reliability between balance and landing scores. As the MSLHST assesses the sum of the two scores, and both the inter-rater and intra-rater ICCs are in clinically acceptable standards, the test can be recommended for inclusion in future clinical trials of recreationally active participants and athletes [4, 9]. A test is only valid if it is reliable and can actually offer information that is relevant to what the test sets out to test. The MSLHST aims to assess an athlete’s balance. Balance and/or proprioceptive exercises are tools for injury prevention and rehabilitation . Knee instability is associated with one-legged jumping performance . Thus, the MSLHST consists of repeated forward and sideways one-legged jumps, and it is considered to challenge the athlete in a way which reflects common forces and manoeuvres that are not only performed in sports , but also help determine if a player obtains an injury or not . As a result, the MSLHST is therefore regarded a valid balance assessment tool. The Multiple Single-Leg Hop-Stabilization Test (MSLHST) is a modernised and valid variant of the Modified BASS Balance Test. It successfully assesses an athlete’s static and dynamic balance and makes a comparison between the dominant and non-dominant leg possible. It is suitable for use in rehabilitation, in repeated measures during a balance/proprioception training programme, and shows potential for information on the return-to-sport status of the test subject. The test should be included in future research on recreational and professional athletes as well as on other populations of similar nature to measure functional balance. Performance Testing entails many, many topics. By choosing to simply read up on The Multiple Single-Leg Hop-Stabilization test and ignore the sea of other crucial Performance Testing topics, you run the risk of being detrimental to your athlete’s success and not realising your full potential. To make you an expert coach and make your life as easy as possible, we highly suggest you now check out this article on The Y Balance Test. Ambegaonkar, Jatin P.; Caswell, Shane V.; Winchester, Jason B.; Shimokochi, Yohei; Cortes, Nelson; Caswell, Amanda M. (2013): Balance comparisons between female dancers and active nondancers. In Research quarterly for exercise and sport 84 (1), pp. 24–29. DOI: 10.1080/02701367.2013.762287. https://www.ncbi.nlm.nih.gov/pubmed/23611005. Ambegaonkar, Jatin P.; Redmond, Charles J.; Winter, Christa; Cortes, Nelson; Ambegaonkar, Shruti J.; Thompson, Brian; Guyer, Susan M. (2011): Ankle stabilizers affect agility but not vertical jump or dynamic balance performance. In Foot & ankle specialist 4 (6), pp. 354–360. DOI: 10.1177/1938640011428509. https://www.ncbi.nlm.nih.gov/pubmed/?term=22184741. Bass, R. I. (1939). An analysis of the components of tests of semicircular canal function and of static and dynamic balance. Research Quarterly. American Association for Health, Physical Education and Recreation, 10(2), 33-52. http://www.tandfonline.com/doi/abs/10.1080/10671188.1939.10625750?journalCode=urqe17. Bryan L. Riemann, Nancy A. Caggiano, Scott M. Lephart (1999): Examination of a Clinical Method of Assessing Postural Control During a Functional Performance Task. In Journal of Sport Rehabilitation 8 (3), pp. 171–183. https://journals.humankinetics.com/doi/abs/10.1123/jsr.8.3.171. Dancey C, Reidy J. Statistics without Maths for Psychology: Using SPSS for Windows. 3rd ed. London: Prentice Hall; 2004. https://www.amazon.com/gp/search?index=books&linkCode=qs&keywords=9780131249417. Emery, C. A. (2003): Is there a clinical standing balance measurement appropriate for use in sports medicine? A review of the literature. In Journal of Science and Medicine in Sport 6 (4), pp. 492–504. DOI: 10.1016/S1440-2440(03)80274-8. http://www.sciencedirect.com/science/article/pii/S1440244003802748. Enderlein, G. (1988): Fleiss, J. L. The Design and Analysis of Clinical Experiments. Wiley, New York – Chichester – Brislane – Toronto – Singapore 1986, 432 S., £38.35. In Biom. J. 30 (3), p. 304. DOI: 10.1002/bimj.4710300308. http://onlinelibrary.wiley.com/doi/10.1002/bimj.4710300308/full. Johnson, Barry L.; Nelson, Jack K. (1986): Practical measurements for evaluation in physical education. 4th ed. Edina MN. : Burgess Pub. https://www.amazon.com/Practical-Measurements-Evaluation-Physical-Education/dp/0023611219/ref=sr_1_2?s=books&ie=UTF8&qid=1515782946&sr=1-2&keywords=Practical+measurements+for+evaluation+in+physical+education. Leanne Sawle, PhD; Jennifer Freeman, PhD, Jonathan Marsden, PhD (2017): Intra-rater reliability of the multiple single-leg hop-stabilization test and relationships with age, leg dominance and training. In The International Journal of Sports Physical Therapy 12 (2), pp. 190–198. https://www.ncbi.nlm.nih.gov/pmc/articles/PMC5380861/. Mohammadi, V.; Alizadeh, M.; Gaieni, A. (2012): The Effects of six weeks strength exercises on static and dynamic balance of young male athletes. In Procedia – Social and Behavioral Sciences 31, pp. 247–250. DOI: 10.1016/j.sbspro.2011.12.050. http://www.sciencedirect.com/science/article/pii/S187704281102979X?via%3Dihub. Read, Paul J.; Oliver, Jon L.; Ste Croix, Mark B. A. de; Myer, Gregory D.; Lloyd, Rhodri S. (2017): A Review Of Field-Based Assessments Of Neuromuscular Control And Their Utility In Male Youth Soccer Players. In Journal of strength and conditioning research. DOI: 10.1519/JSC.0000000000002069. https://www.ncbi.nlm.nih.gov/pubmed/28658071. Riemann, Bryan L.; Guskiewicz, Kevin M.; Shields, Edgar W. (1999): Relationship between Clinical and Forceplate Measures of Postural Stability. In Journal of Sport Rehabilitation 8 (2), pp. 71–82. DOI: 10.1123/jsr.8.2.71. https://journals.humankinetics.com/doi/10.1123/jsr.8.2.71. Risberg, M. A.; Ekeland, A. (1994): Assessment of functional tests after anterior cruciate ligament surgery. In The Journal of orthopaedic and sports physical therapy 19 (4), pp. 212–217. DOI: 10.2519/jospt.1994.19.4.212. https://journals.humankinetics.com/doi/10.1123/jsr.8.2.71. Tsigili, N. (2001): Evaluation Of The Specificity Of Selected Dynamic Balance Tests. In Pms 92 (3), P. 827. Doi: 10.2466/Pms.92.3.827-833. http://journals.sagepub.com/doi/10.2466/pms.2001.92.3.827. Lukas is a second-year master student in Exercise Physiology (M.Sc.) at the Norwegian University of Science and Technology (NTNU) in Trondheim, Norway. He holds a B.Sc. Physiotherapy from Germany with a specialisation in sports medicine.